David E. Fisher, MD, PhD, is chief of the Massachusetts General Hospital Department of Dermatology. He also serves as director of Mass General’s Cutaneous Biology Research Center, director of the Melanoma Center and as Chair of the MGH Executive Committee on Research. 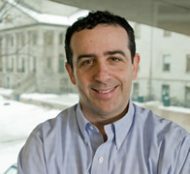 A professor of dermatology and of pediatrics at Harvard Medical School, Dr. Fisher came to Mass General from the Dana-Farber Cancer Institute, where he previously directed the melanoma program. Dr. Fisher’s research has focused on understanding the molecular and genetic events which underlie formation of melanoma as well as skin pigmentation. As a clinician, he has worked to translate these understandings into advances in diagnosis, treatment and prevention of human diseases related to the skin and associated disorders. A graduate of Swarthmore College with a degree in biology and chemistry, Dr. Fisher is also an accomplished concert cellist and graduated from the Curtis Institute of Music in Philadelphia. He received his doctorate under Nobel Laureate Gunter Blobel and Henry Kunkel at Rockefeller University and his medical degree at Cornell University Medical College. Dr. Fisher’s specialty training in Medicine, Pediatrics and Oncology were carried out at Massachusetts General Hospital, Dana-Farber Cancer Institute, Boston Children’s Hospital, and Brigham and Women’s Hospital, Harvard Medical School. His research contributions include elucidation of the pathway through which UV radiation induces pigmentation, identification of MITF as master transcriptional regulator in melanocytes and melanoma oncogene, novel approaches to melanoma treatment and prevention, and discovery of the link between ultraviolet radiation and addictive behaviors.